As I stepped on board "Stealth," I thought at first that I was entering a grey grotto miles away from the magnificence of the many yachts that I had recently boarded. In actual fact, it was that very impression of entering into the carcass of this object exclusively designed to navigate, coupled to Captain Castelli's personality, culture and passion, that immediately triggered my enthusiasm for this sailing boat and the sea in general. We sat at the bows round a Spartan table and began our conversation that was shortly about to surprise me. Captain tell us about yourself, where were you born exactly and what were your primary studies? I was born in Genoa and went to the Andrea Doria school to study the classics. You are the first skipper that I've interviewed to have studied the classics! Is there anyone in your family that you recall working on ships? My grandfather, on my mother's side and his family had a shipping company with tugs and barges. Then as a result of a quarrel amongst brothers, my grandfather sold the business and I was destined to lead the classic lifestyle of an independent professional. Instead what happened, how did you get involved with the sea? When I was around sixteen I developed a passion, with a group of friends. Then I enrolled in the "Sportiva Quarto" and began to regatta. On finishing school, I thought that the time had come to begin my real life and I found work in a shipping firm with offices in Genoa and Leghorn. 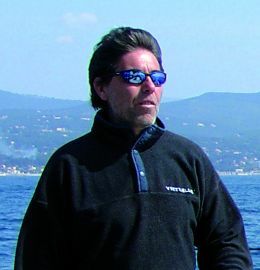 I continued sailing as a hobby, however, and on becoming an instructor, I remember going with pleasure to summer courses in Caprera where I had a lot of fun and was even paid for it! What events induced you to take your first command? I started by getting a very banal helmsman's certificate and by painting hulls and generally working as a labourer on boats in Lavagna. In other words by typically starting from the ranks. I gradually put myself on the market and my great advantage over others was my sailing ability which at the time was no mean factor. My first experience as skipper was on "Ran" a 59' Bruce Farr racing cruiser belonging to Gabriele Cagliari who at the time was ENI's president. She was a very Hi-tech fraction rigged boat in Kevlar. Those were the days of regattas and sponsors, an enlightening period indeed. Then came "Edimera" a Frers 65,' "Virtuelle" an 80'disigned by Valiccelli and Philippe Stark owned by Carlo Perrone and later still "My Song" an 85' Reichel-Pugh owned by Pierluigi Loro Piana. Here you are now on "Stealth," what exactly does this name mean? It means furtive hence invisible. Stealth was the name of the F111 fighter plane that radars couldn't trace. You must think that when she was launched in 1996 she was an absolute novelty, a dark bodied yacht with dark sails and absolutely essential dark interiors. It was a boat which broke with tradition stemming from Giovanni Agnelli's willpower to commission an avant-garde project for a sailing yacht uncaring of every international rating rule whose sole objective was to reach the highest possible speed. In fact, this was the first time that water ballasts were employed on a boat that wasn't purely meant to regatta. What does it mean to you to be "Stealth's" captain? What is the boat's spirit? She is a boat which has made legend and I consider it an honour to be in command of the crew. "Stealth" sails beautifully, fast, light and I've even touched a top speed of 24 knots but she can reach 30. She is such a pure boat, without compromise, that can sail magnificently in any condition, close hauling or running she has nothing amiss. In the eternal debate between aesthetics and functionality, I would like to ask you if you find "Stealth" comfortable? Most certainly, when a professional such as German Frers designs a boat exclusively for the use it is made for, hence to sail, the result is both comfortable, aesthetical and functional. If a lot of comforts are placed inside a boat, she may be more comfortable when in port, certainly not as much when she's underway. When "Stealth" is at sea she's comfortable, spacey and by no means claustrophobic inside. What do you think of the yachting world that you mix with? I think it important to carry out this job with passion, not only because one can travel, earn well and live in a world of luxury. It's a job that gives you a lot but takes a lot too in terms of responsibility and commitment. It's also very difficult to nurture relationships and loves. I've personally been able and it certainly wasn't without effort, to make my work merge with my private life, in fact I have a wife and four children from 8 to 19. I like the work that I'm luckily doing as well as keeping abreast of matters in a very simple way which is by reading and studying them. Schooling: High School, University: languages unfinished. Professional Title: Captain up to 50 tons for both commercial vessels and pleasure yachts. Correlated qualifications: Survival, fire fighting, safety, GMDSS communications, Radar and PSSR, First Aid. The Yacht's main characteristics: Design by German Frers, Interior: open space with 12 berths, a wc and shower, tiny galley, dining area with irremovable table and seats at the bows. 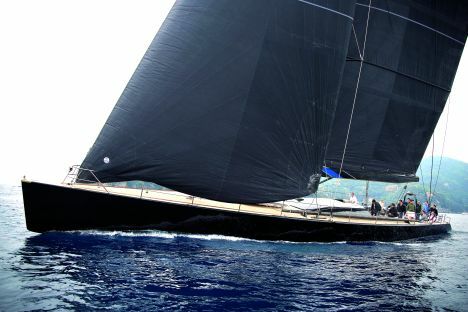 Technical and structural data: Lenghth overall: 28.2 m. beam: 6.10 m. draught: 5 m. Keel: 16 tons. Structure: pre impregnated sandwich carbon fibres and vacuum-packed Nomex, after treatment c/o Green Marine, Lymington, England. Sloop rigged with a 38 m. mast and an 11,30 m. boom in carbon fibre made by Southern Spars, New Zealand and designed by Andy Steiner. Sails are produced by North Sails Italy, U.S. and New Zealand as well as by Quantum U.S. for close hauling surface of 420 sq.m and a running surface of 720 sq.m. The boat has a 3000 litre water ballast system to increase its straightening potential hence its power and speed under sail. Pulpits and stanchions are in titanium. Deck rigging: Lewmar, Harken, Frederiksen and custom made solutions. Deck: in teak. Interior design: mono colour dark grey. Materials used for the structures: pre-impregnated carbon fibres, for non structural bulkheads the same carbon 3DL material used for sails. Tubular carbon fibre berths with hoist to adjust their inclination if required. The essential interior design stems from the intrados of the yacht's structural parts. Which innovations in the yachting world have struck you the most and why? Most certainly composite fibres for the lightweight results produced in manufacturing boats. Above all though I'd say the GPS which, fortunately or unfortunately, has made navigating possible for everyone instead of being open to a restricted number of professionals.